A booking app won’t just streamline your booking process, it will help engage your customers, build loyalty, boost retention, and generate more revenue for your business. We live in a mobile age where we use our phones more than our computers, and the range of activities that can be done on a mobile device is constantly growing. Whether you are looking for a convenient way for customers to reserve tables in your restaurant, book appointments at your beauty salon, or secure a room in your hotel, we will show you how to build a booking app, and the benefits it will bring for your brand. 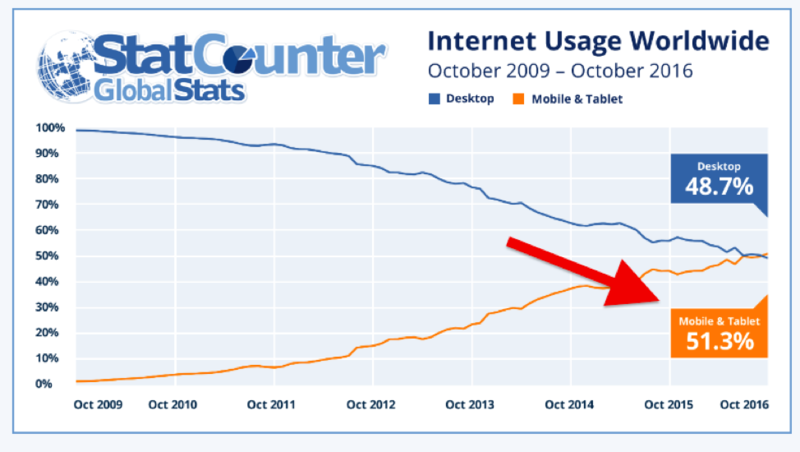 According to Hospitalitynet, 49% of direct online hotel bookings are now done on mobile. 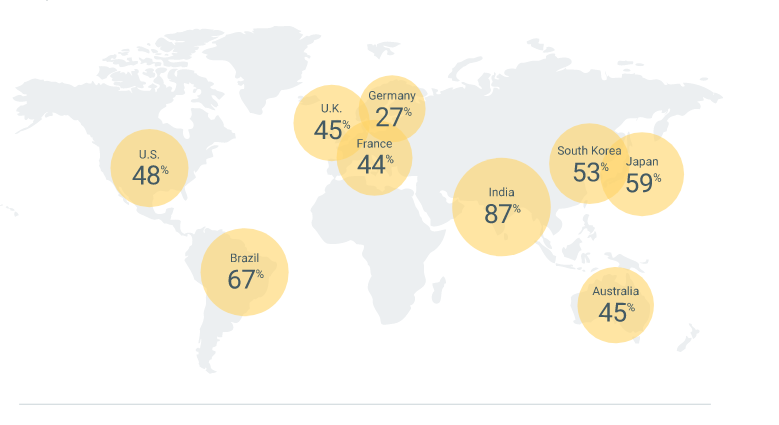 In the UK, 45% of people are comfortable researching, planning and booking their travels via mobile, according to Google Consumer Insights. 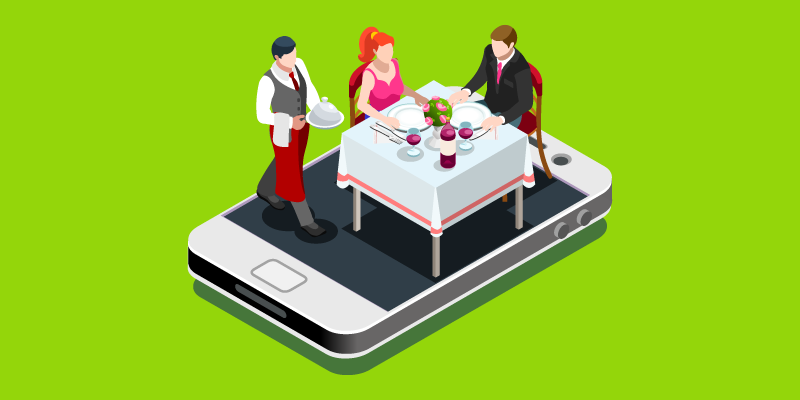 A quarter of people have at least one restaurant app on their smartphone, according to a US survey, and millenials have an average of 2.3 restaurant apps on their phones. Health and beauty app MindBody report that someone books an appointment or class every 0.7 seconds. So booking apps are here to stay, and you need to get in on the action. You want your customers to be able to book your services at any point in their day, and wherever they happen to be. Often they’ll be at work, or won’t have a computer with them when they want to book, but it’s almost guaranteed they’ll have their smartphone with them. Providing them a booking app offers a super convenient way for them to book your services. Think about how Uber revolutionised the taxi industry with their super accessible booking app. And now smart taxi firms are providing apps because people expect a certain level of convenience in a competitive market. Apps also help take the confusion out of booking. Users don’t have to scroll through their contact list to dig out your phone number, nor do they need to trawl through your website to find a booking form. All they have to do is pull up your app and they’re good to go. Wired Cafe Bar found that building a booking app actually boosted their sales, giving them a 22% lift over just 4 months. After Spokes Bike Store built a booking app they saw a 74% increase in enquiries. A massive 34% of their orders are now made through their mobile app. 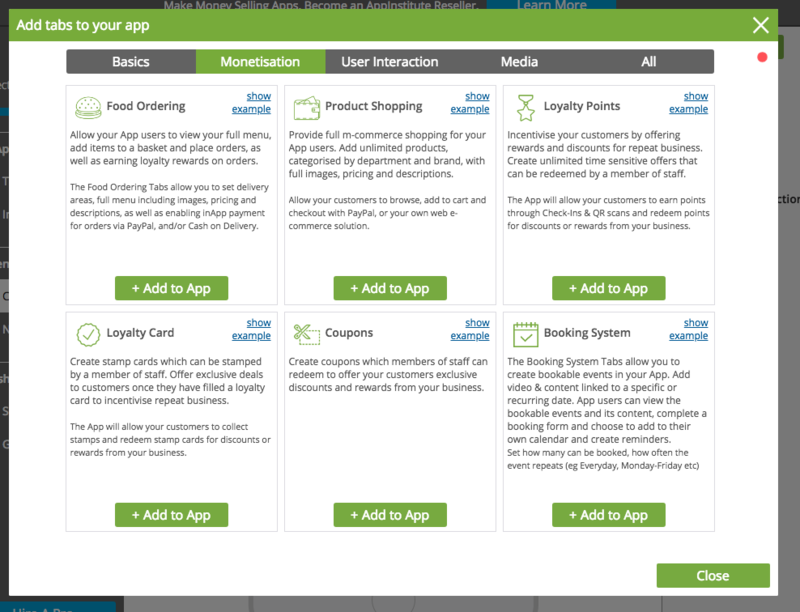 AppInstitute make it easy to build dynamic apps for all business types. Here’s how to create a booking app for your business. Go to the App Institute homepage and click “build your app now”. Click “create new app”, or select your existing app if you already have one. 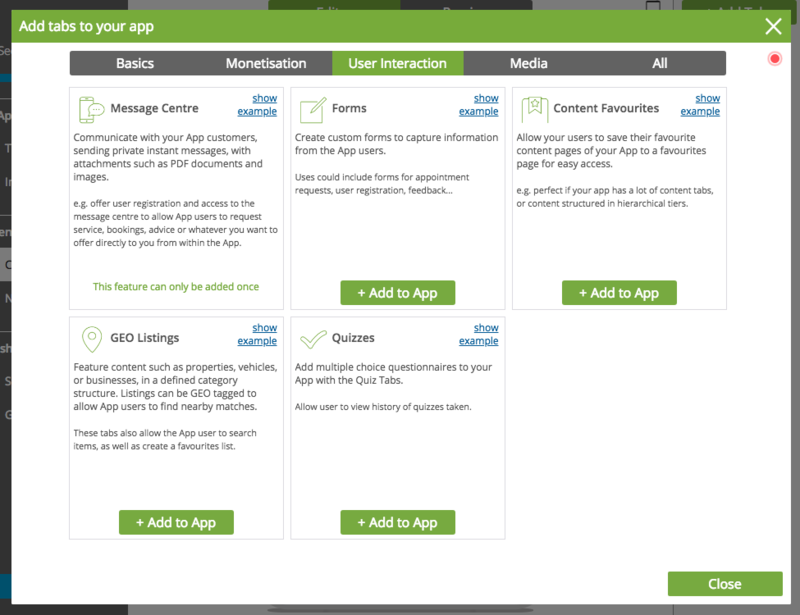 Follow the onscreen instructions to setup your app. Select one of the “get bookings” options in the menu at the top of the screen, and choose a relevant template for your business. Use the panel on the left side of the screen to go through each section of your app design, adding images where prompted. To add booking request forms, select to the “content” section in the left panel. This will open up the content interface on the right of the screen. Your app template is stocked with basic sections, called “tabs”. You can add extra tabs for additional functionality. 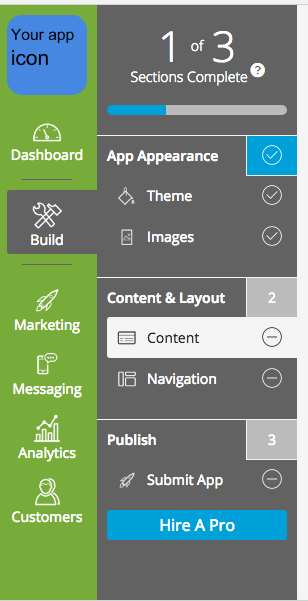 ﻿ At the top of the content panel you will see an option to “add tabs”. 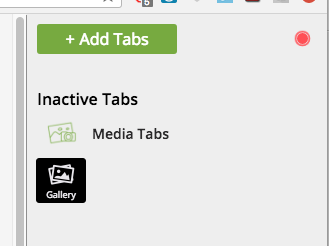 Click it and a screen will pop up with a range of tabs to pick from. Select the “user interaction” option in the top menu. 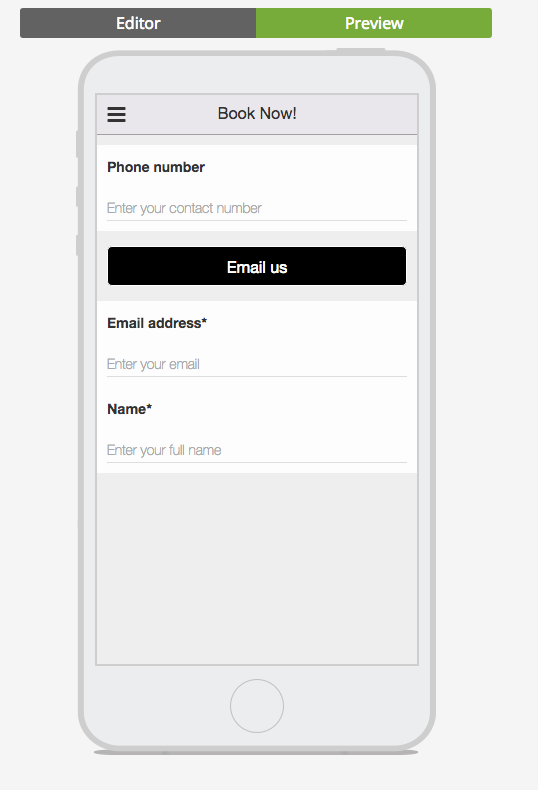 We will use the “forms” tab to create a booking request form in your app. 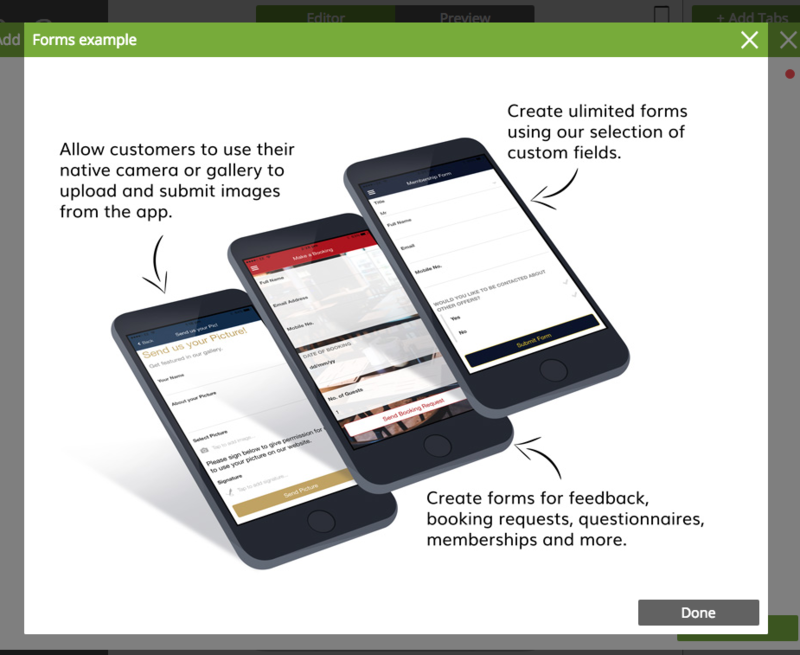 Click “add to app” under the forms option and this will open the “manage form tab”. 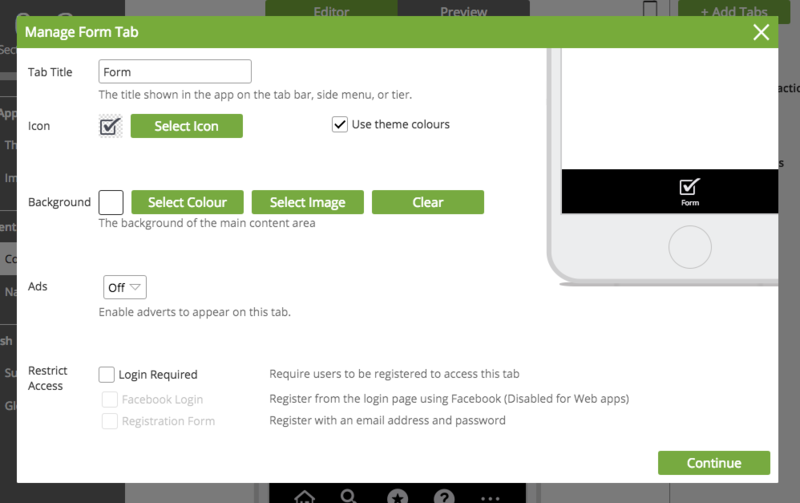 This tab lets you name your form and adjust the colour scheme. It also offers features like whether the contact form requires registration or not. Click “continue” and you will see a screen which lets you select various form features to add, such as text and number fields, check boxes and contact buttons. You can also set an automated response message to be sent to users once they have submitted a booking request. Once you have designed your booking form, you will see it listed as an “inactivate tab”. 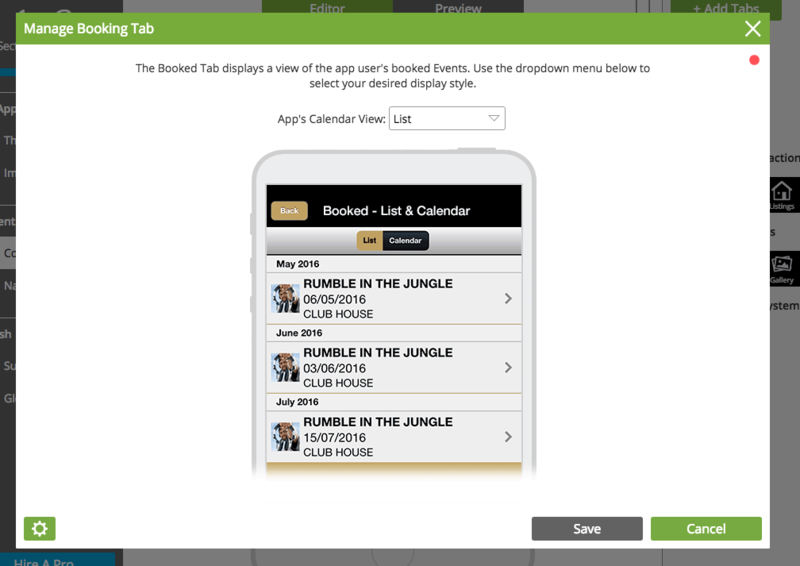 Just drag the booking form tab onto the menu section of the mobile visualiser in the centre of the screen, then move it around to position it where you want it. 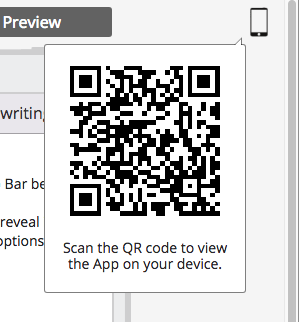 Switch to “preview” mode to see what the app will look like, or hover over the mobile icon on the top right, this will give you the option to demo the app on your mobile device by scanning a QR code. 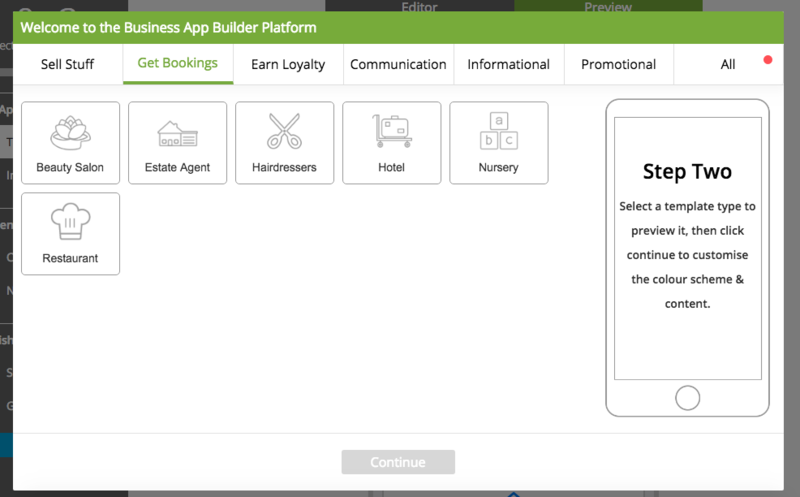 To add a booking system to your app, select the “booking system” tab in the “monetisation” menu option. 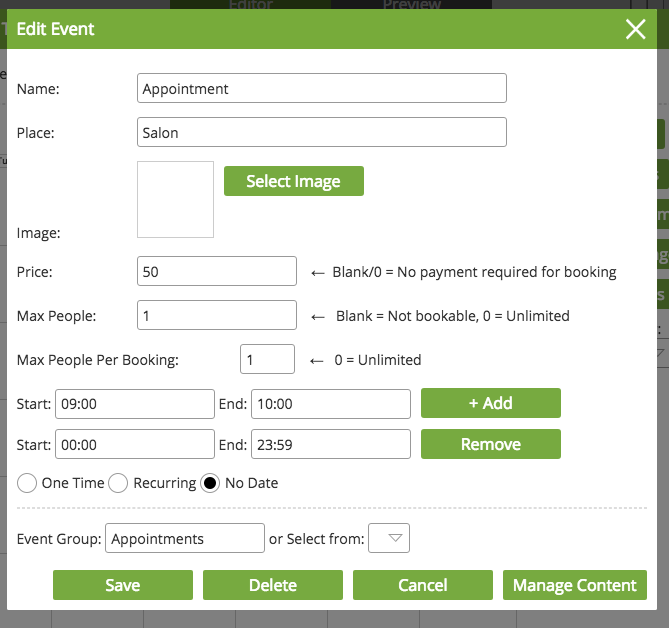 Select “add to app” and you will be presented with a screen which will allow you to create a customised appointment calendar for your users. 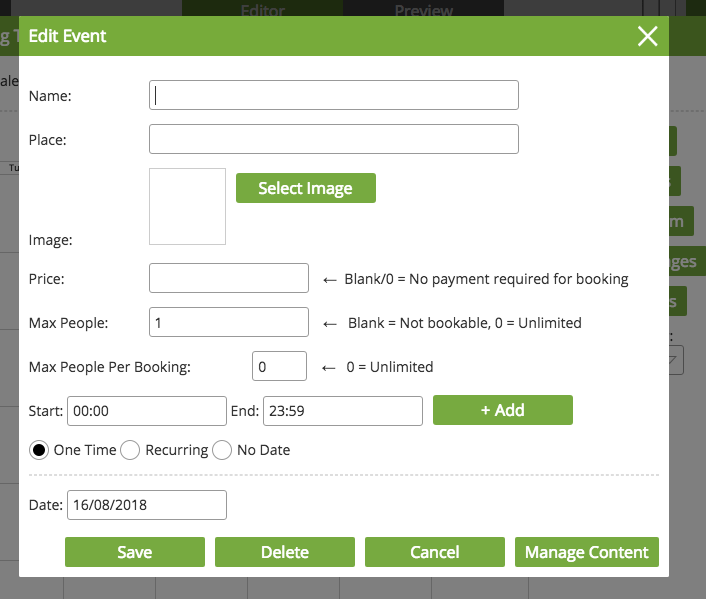 You can create new calendar events, edit your booking form, offer various payment options, and customise your response messages. You have the option of creating two different tabs: “booking” and “booked”. The booking tab offers a calendar of upcoming events for your business which will be listed in the app. Select “add event” to create a new event. Enter the event name and location and select an optional image to go with it. If there is limited space at your event you can set a maximum attending amount. Enter the time and date and select whether the event is recurring or not. 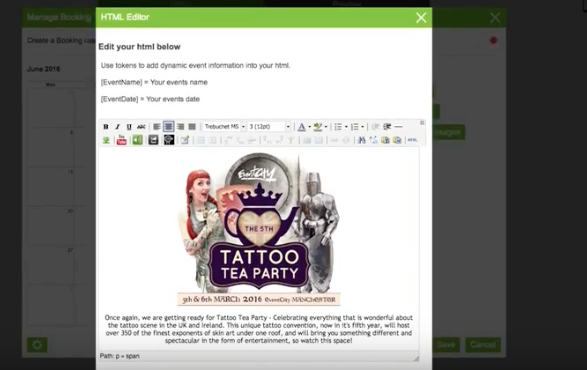 The “manage content” section allows you to add additional event info such as images, video, website links and text. ﻿ You can also import event info from other booking tabs and edit the booking form to collect the information that you need. Next you can edit the response message users get after making a booking. 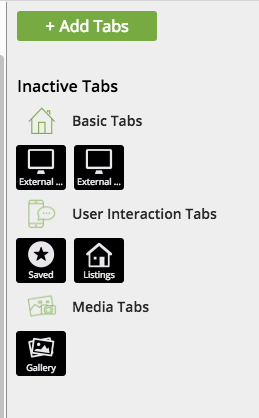 Name the booking tab and upload a tab icon in “tab settings”. The booked tab shows a list of the users’ booked events. You can change the app calendar view to list, calendar, or list and calendar. 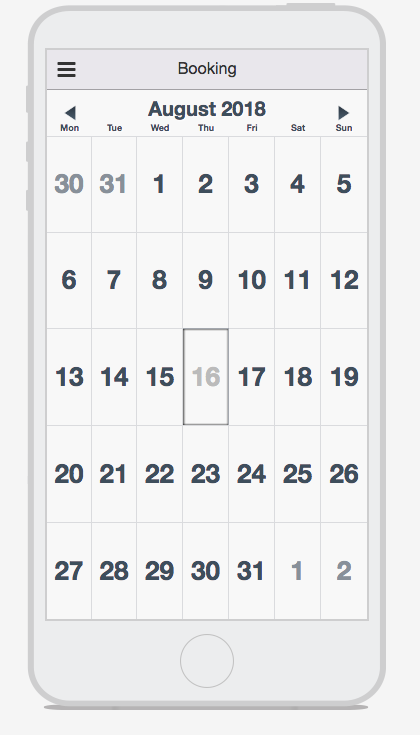 As you design your booking app, make sure to regularly check its look and functionality in the preview window. Once you’re happy with your design, the next step is to download it on your phone via the QR reader in the top right corner. If at any point you want our help, select the “hire a pro” option in the bottom left of your screen. Once you are happy with your app, select “submit app” in the bottom left of the build screen, and select a plan that suits your needs. 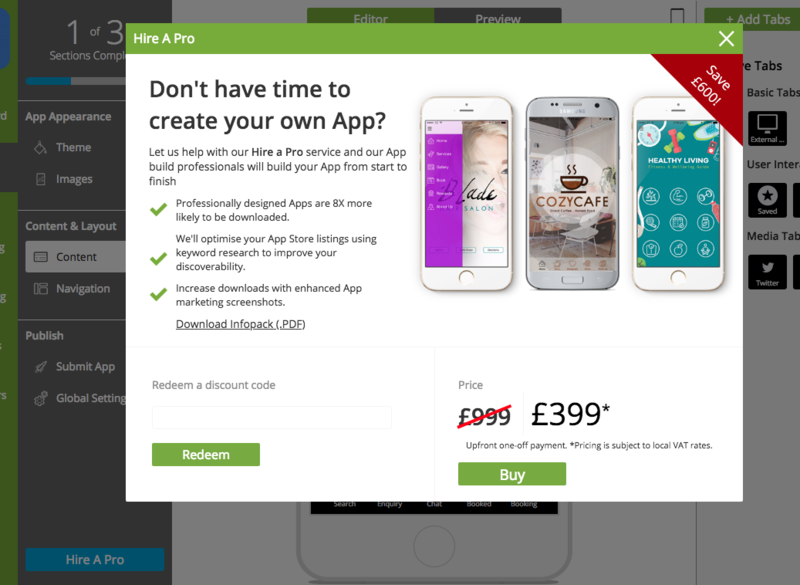 To find out more about building the right app for your business, get in touch today or take a look at our blog for more app building and marketing advice.